After a successful 21-month pilot program, the Bay Area Bike Share (BABS) system is increasing the number of bicycles it will provide to the cycle-commuting public from 700 to 7,000. BABS will also add three new cities. Studies have shown that increasing bicycle commuting provides communities with public health, financial, traffic safety, and road capacity benefits. According to an announcement by the Metropolitan Transportation Commission, BABS, initially focused on the cities of San Francisco and San Jose, will expand not only there, but will also extend to the East Bay Area communities of Berkeley, Emeryville, and Oakland. 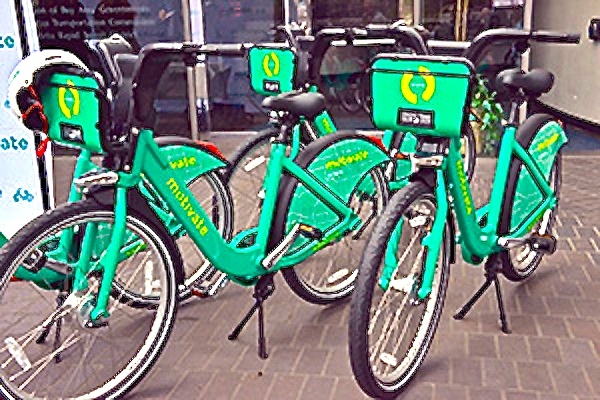 After the expansion, BABS is expected to be the second largest bike share program in the U.S.
BABS is a public-private joint venture. Once fully implemented the 7,000-bike program will rely on revenue from member and user fees and sponsorships and receive no operating subsidies from the public sector. However capital costs for future expansion into new communities beyond the current five will be paid for with public funds. Twenty-five percent of the new bikes are to be in service before summer 2016 and the remainder are scheduled to come online before Thanksgiving 2017. Other cities with large bike share programs include Paris with approximately 18,000 bicycles, London with 10,000, New York with 6,000 (and plans to expand to 12,000), and Chicago with 4,700. Hangzhou, China’s system is claimed to have 60,000 bikes. Wuhan, also in China, has around 90,000 bikes in its share system.